A Boolean that controls the reseeding of the binary MLS generator after the first call of the node. True Accepts a new seed and begins producing binary MLS samples based on seed. False Maintains the initial internal seed state and resumes producing binary MLS samples as a continuation of the previous binary MLS. Order of the modulo-2 primitive polynomial. If the input value is out of range, this node truncates the polynomial order to [3, 62]. Number that this node uses to initialize the binary MLS generator. This node initializes the binary MLS generator using seed if reset is True or if this is the first call of the node. seed is greater than 0 Generates binary MLS samples based on the seed value. For multiple calls to the node, the node accepts or rejects new seed inputs based on the reset value. seed is less than or equal to 0 Generates a random seed value and produces binary MLS samples based on that seed value. For multiple calls to the node, if seed remains less than or equal to 0, the node ignores the reset input and produces binary MLS samples as a continuation of the initial binary MLS. The uniformly distributed, pseudorandom pattern. This node uses a modulo-2 primitive polynomial to generate the binary Maximum Length Sequence (MLS). The MLS is periodic with a period of 2n - 1. Each period consists of 2n - 1 ones and 2n - 1 - 1 zeros, where n is the polynomial order. The MLS is spectrally flat, with a near-zero DC term. where ⊕ is the modulo-2 addition, and a0, a1, a2 and a3 are the shift registers. The following 15-point sequence comprises each period of the generated sequence: 0, 0, 0, 1, 0, 0, 1, 1, 0, 1, 0, 1, 1, 1, 1. However, the starting point might be different for each sequence. 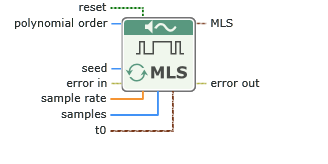 The MLS is a type of Pseudo-Random Binary Sequence (PRBS).